﻿International Day against Nuclear Tests: Calendar, History, Tweets, Facts, Quotes & Activities. The International Day against Nuclear Tests seeks to raise awareness about the negative effects of nuclear weapons and the need to achieve a nuclear-weapon-free world. The day also serves to educate people everywhere about the need to ban nuclear weapon tests in order to ensure world safety. Since the first nuclear test in 1945, over 2,000 nuclear tests have been carried out and led to accidents, such as the Chernobyl, Ukraine accident of 1986, ending in tragedy, long-term radiation poisoning and atmospheric damage. 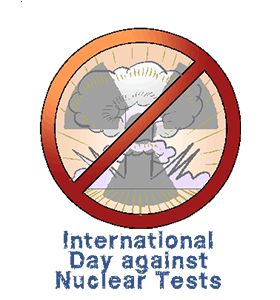 International Day against Nuclear Tests was declared by the United Nations General Assembly in December 2009. It is observed every year on the 29th of August, a day that commemorates the 1991 closure of the Soviet Semipalatinsk site, the world's largest nuclear testing facility, in the former Soviet Republic of Kazakhstan. The US, The Soviet Union and France have carried out the most nuclear tests over the past 6 decades, with 1,032, 715 and 210 respectively. The cost of the Manhattan Project, where the first nuclear bomb was ever built, is estimated to have cost $20 Billion. The total number of nuclear missiles built from the year 1951 to the present is 67,500. There are an estimated total of 16,400 nuclear weapons on Earth today. So long as nuclear weapons continue to exist, so will the temptation to threaten others with overwhelming military force. – Daisaku Ikeda, Buddhist philosopher, educator, author and anti-nuclear activist. Watch a movie or documentary about nuclear disasters. Some suggestions are: The Day After (1983), Threads (1984), Trinity and Beyond (1995), Fukushima Nuclear Disaster and Seconds from Disaster: Meltdown at Chernobyl . Attend the meeting held by the president of the UN General Assembly by either going to the event in person or watching the recorded webcast. Read a book about nuclear issues in the world today. Some suggestions are: Contesting the Future of Nuclear Power (2011), In Mortal Hands (2009), and Nuclear or Not? Does Nuclear Power Have a Place in a Sustainable Energy Future? (2007). Donate to the Pacific Nuclear Charitable Foundation. Its primary goal is to promote philanthropy and medical research on the specialty of nuclear medicine. Spread awareness about the day by using the hashtag #InternationalDayAgainstNuclearWeapons, #notonuclear #againstnucleartests.